The third time was a charm! The trip that had been cursed and cancelled twice by bad weather, happened on a picture perfect, endless viewing, Spring day. March truly went out like a lamb. A group of 6 attended which was great as 2 cars were needed for a car spot. We parked Franks car at the Crawford Depot, and mine at the lower parking area of the Willey House Station. A decision to skip the Kedron Flume slide down was made as the warm weather and snow melt would have made the rocks very slippery. We stayed on the Ethan Pond trail to the end instead only adding .3 miles making the trip 8.8 miles in total as the upper parking area is closed in Winter. Our hike began on the Avalon Trail, which rises slowly but steadily from Crawford Depot. The trail was hard packed snow that made for bare booting most of the trip. Some opted for crampons early as it was slippery in spots but doable without. We reached the junction of the A-Z Trail, which led us up to the col that lies between Mt. Tom and Mt. Field. We then turned right onto the Mt. Tom Spur Trail, a .6 mile jaunt to the Mt. 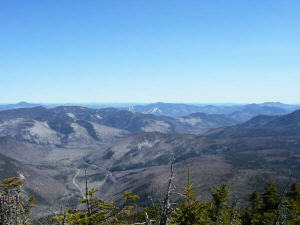 Tom summit (elevation 4047 feet). Prior to hitting the summit, we went off to a viewing area on the other side and enjoyed lunch in the warm sunshine. 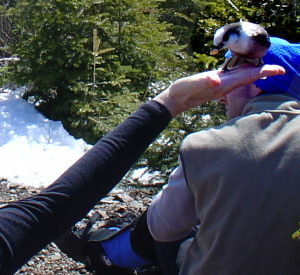 We shared lunch with the Canadian Jays, these birds land right on your hand in order to retrieve food. 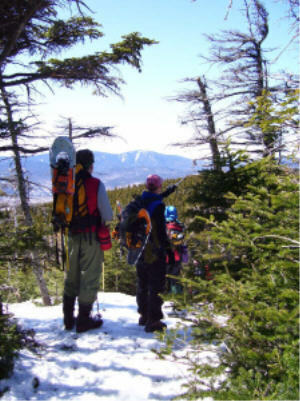 From Tom and Field we enjoyed the endless views and clearly saw the Vermont summits of Camels Hump and Mansfield in the distance. Also enjoyed were the local views of the Twins, Bonds, and Chocurua. At the bottom of the Mt. Tom Spur Trail, we continued another 100 yards up the A-Z Trail until the junction of the Willey Range Trail. 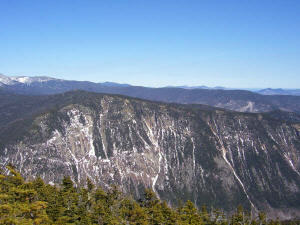 The Willey Range Trail travels to the summits of Mt. Field (elevation 4326 feet) and Mt. Willey (elevation 4302 feet) and then continues until it meets up with the Ethan Pond Trail which we followed back down to Route 302. The descent down the south side of Mt. Willey, was one of the steepest descents that I can recall in all the Whites. There were ladders to make things easier for hikers, but they had some snow and ice cover. We all wore are crampons down as it was so steep! Ed provided entertainment to some by getting his crampon caught and doing a complete summersault . No pictures available. On the good side, Eds injury was ugly but repairable. He dislocated his finger, popped it back in the socket and off we went. He is a trooper. We were down by 5:30 and were glad we made this trip on such a beautiful day.